The stock motor mounts do a fine job of what they do but over time they tend to crack, wear and fall apart. It's a gradual process but one day it will hit you that your MINI Cooper just feels worn out. One of the firsts things to look at is the motor mounts, as they are prone to crack and deteriorate. It's best to replace them before they tear in half leaving your engine bucking up and down while making reverse dents in your hood as you accelerate and wonder what's going on. 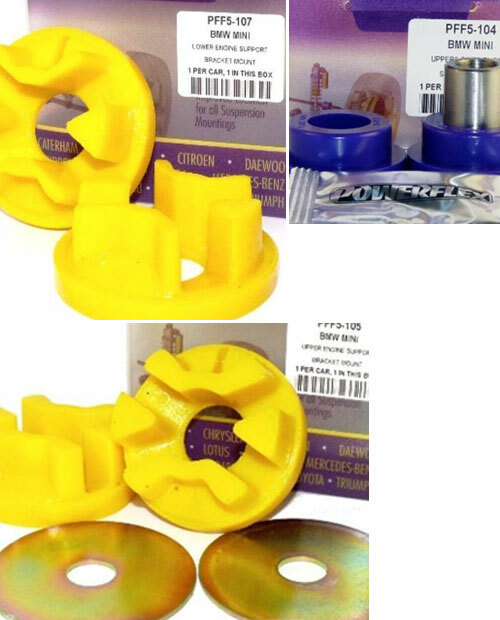 This Powerflex Motor Mount/Engine Bushing kit is a major improvement over the soft stock bushings and will reduce a great deal of movement in the engine which will, in turn, allow more power to go straight to the wheels instead of being wasted on motor mount flex. It's hard to explain how much of a difference this makes but it is well worth upgrading to a more rigid urethane motor mount system. *MINI changed the upper mount sometime in early 2005 to a hydraulic bushing. Please confirm via visual inspection if these bushings will fit your year and model as MINI has changed the motors mounts at least once since the car was released.